Tom Perry is a real estate investor from Houston, Texas. He is a founding partner of Houston House Buyers, and is also known for a daily radio show called Right Path Real Estate Radio, where he gives advice, discusses strategy, marketing, and how to build real estate investing into a business. Propelio’s Daniel Moore was lucky enough to spend some time with him and talk about how he got his start, his marketing techniques, and how he built and branded a large real estate business. But Tom didn’t start in real estate investing. He actually started in construction catering to real estate investors. Fast Track Remodeling was founded in 2010, and to date they have remolded about 800 homes. This is where he met his real estate investing partner, Jason Bible. Once Tom and Jason decided to partner, they each put about $20,000 of their own money into marketing. They spent about $5,000 a month, all direct mail, for 3 months, and didn’t get any real estate deals. Then, from October to December of 2013, they were able to contract 7 houses making about $450,000. The two put the money back into the business to market more, and business expanded rapidly. So much so, in 2014, Tom gave away Fast Track Remodeling to his brother so he could focus on real estate investing full time. “Yes.” Tom replied. He explains that his brother was already in construction, and instead of hiring him, Tom just gave him the company. Tom also goes on to say how he and Jason didn’t keep any of the money from the first year of sales – they put it all back into marketing. He says people assume HHB only takes the best real estate deals, but truth is, they use this formula and do all the real estate deals just the same. It allows them to rehab homes for profit and wholesale homes for cash flow. “Cash flow keeps businesses in business short term, profits keep businesses in business long term,” Tom adds. With 67 properties in their first year, Tom and his partner expanded to handle the volume. They now have a call center, an acquisitions team, as well as administrative support. “Do you have property, one of those crazy stories in the background, where you wish you never would have signed on that line?” Daniel asks. He goes on to tell how that home was rather unique – over 6,800 square feet, 7 years old, had bad view, but good condition and good neighborhood. Homes like it in the area had sold easily, and well over $450,000. He adds, “I don’t care what the price is, there’s not a lot of buyers for that house.” And even though they kept lowering the price, the market pool was just small for that type of house. HHB did sell it for more than what they paid for it, but since they had to hold it for months longer than they expected, once utilities, insurance, and taxes were figured in they ended up losing money on that real estate deal. “That just means they haven’t done enough deals.” Tom says. The two agree that real estate deals where you lose money are always the ones where you learn the most. “We’ve met many private lenders who’ve said that they won’t personally loan their own money to anyone who hasn’t lost money on at least one deal.” Tom adds. And if that’s the case, and HHB had over 100 real estate deals before they lost money, then where are they getting their funding? Tom says when they first started they used hard money. Then, after a few real estate deals, they starting meeting with private investors and have been using private lenders ever since. The pair has never used any of their own money to finance a real estate deal. “Money is out there. As long as you have the deal, the money is out there,” Tom states. “We just crossed the 400 number in July,” Tom answers. “So with over 400 deals, the majority of those deals you didn’t have any of your own money into?” Daniel continues. “None of them.” Tom says. “So money is easy to find?” Daniel finishes. “You find the deal, money will find you. Money chases good money. At least, that’s been my experience.” Daniel concludes. Tom nods in agreement. With all the success that Tom and Houston House Buyers have had, what’s his daily life like? What does he do with his success? He still works of course. Tom says he spends about 5% of his time at HHB. He goes in for sales meetings to check the status of projects and to make sure things are running smoothly. He also says he spends about 30% of his time at Quality Property Solutions, his second real estate investment company. Quality Property Solutions deals with properties that have title issues that require him to personally oversee. But Tom spends most of his time at Right Path Real Estate. Right Path Real Estate is more of a coaching program – they do seminars, retreats, and classes for new and seasoned real estate investors looking to grow their business. Right Path Real Estate also has a radio show 5 days a week, broadcasting in both Houston and Dallas, where real estate investors can hear about trends in the industry, get tips, or even call in for help or advice. And while there are rumors about the market getting tighter and less opportunities available he’s still finding good real estate deals. But how? “Marketing! Marketing! Marketing! Marketing!” Tom says. Tom shares that when HHB first started they mistakenly sent out post cards with 9 digit phone numbers instead of 10. “We really messed up.” He says sheepishly. “But we still got buys off of that!” he adds. Tom agrees and says that’s not just good advice for marketing, but for building a business too. He says he’ll ask other real estate investor’s what their goal is, because no one did that for him when he started. 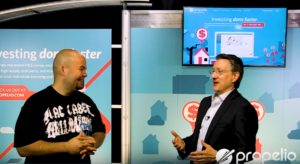 He explains there’s no “cookie cutter” approach to this business, so what the goal is for 55-year-old real estate investor is different than a 28-year-old real estate investor. You first need to look at where you are starting, find a path for your goal, and focus on it. Daniel takes the opportunity to inquire about the mentoring or teaching program Tom provides through Right Path Real Estate. Tom says his most popular program is a weekend retreat where real estate investors come and learn everything about the business. He teaches participants how they built their business, how to market, how to find funding, sales, and how to scale their business. “We actually give them our private money raising pitch,” he adds. “It’s a lot of information to absorb in a weekend;” Tom admits, “some people find it overwhelming.” He also explains that new real estate investors will learn a lot, while even seasoned real estate investors will gain more knowledge on how to add value to their business. “I think it all starts right there,” Daniel says as he points to his head. Daniel shifts gears a little and asks Tom what sacrifices he’s had to make to get to where he is as a real estate investor. He goes on to say how some of his students are doing really well in his program – after 6 months they are on track to do $1 million this year. “I feel excited about that. I feel like a proud parent,” he adds. Daniel concludes by asking Tom what his goals are for the next 5 years. If you would like to get in touch with Tom Perry or find out about one of his classes or seminars, you can visit him online at RightPathRealEstate.com. You can also follow them on Facebook, or write in for advice on their radio show which broadcasts on Facebook Live, AM 1110 from 9am – 10am in Houston, or AM 620 from 3pm – 4pm in Dallas everyday. If you want to start marketing for good real estate deals, subscribe to Propelio today. And if you want more insight from pro real estate investors and to keep up with tips and trends in the real estate industry, follow us on Facebook or subscribe to our YouTube channel. Because at Propelio, we speak your language.